Read labels carefully. Temperature labels show if the bird is fresh or frozen. If you plan to serve a fresh turkey, buy it no more than two days before Thanksgiving. Do not wash the turkey. This spreads pathogens onto kitchen surfaces. The only way to kill bacteria that causes foodborne illness is to fully cook the turkey. Prevent your Thanksgiving from going up in flames. According to the U.S. Fire Administration (USFA), cooking is the main cause of home fires. 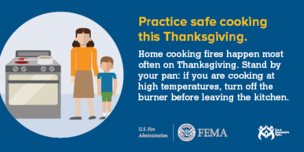 Also, the peak day for home cooking fires is Thanksgiving. Stay in the kitchen when you are frying, boiling, grilling, or broiling food. If you leave the kitchen, turn off the burner. If you simmer, bake, or roast food, check it regularly and use a timer to remind you. Keep anything that can catch fire (oven mitts, wooden utensils, food packages, towels, and curtains) away from your stovetop. Turn pot handles toward the back of the stove. Then, no one can bump them or pull them over. Keep a pan lid or baking sheet nearby. Use it to cover the pan if it catches fire. This will put the fire out. In the event of an oven fire, turn off the oven and keep the door closed until it is cool. Keep children away from the stove. The stove will be hot, and kids should stay three feet away. For more tips, visit the USFA’s Cooking Fire Safety page. 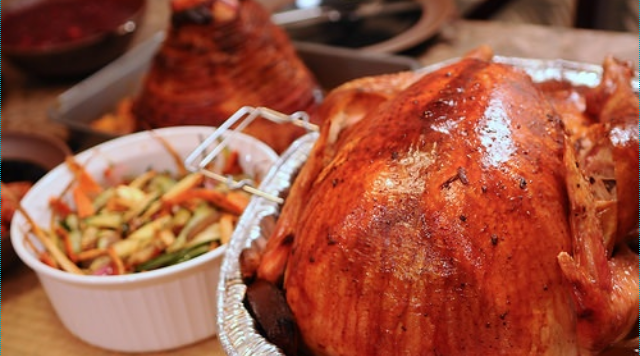 If you plan to deep fry your turkey, download the Prevent a Turkey Fryer Fire tip sheet. On behalf of all of us here at the Daily Outsider, Happy Thanksgiving!! !